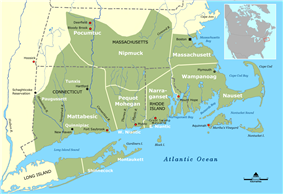 Prior to the arrival of Europeans on the eastern shore of New England, the area around Massachusetts Bay was the territory of several Algonquian-speaking tribes, including the Massachusett, Nauset, and Wampanoag. The Pennacooks occupied the Merrimack River valley to the north, and the Nipmuc, Pocumtuc, and Mahican, occupied the western lands of present-day Massachusetts, although some of those tribes8,000. This number was significantly larger as late as 1616; in later years contemporary chroniclers interviewed Indians who described a major pestilence that killed between one and two thirds of the population. The land use patterns of the natives included plots cleared for agricultural purposes, and woodland territories for the hunting of game. Land divisions between the tribes were well understood. Early in the 17th century a variety of European explorers, including  English ships continued to come to the New England area for fishing and trade with the Indians. In December 1620, a group of Pilgrims, seeking to preserve their cultural identity, established Plymouth Colony just to the south of Massachusetts Bay. 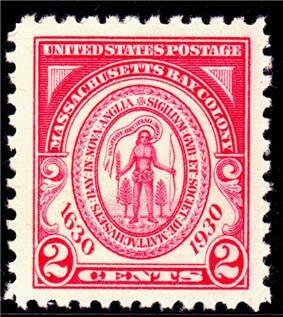 Their settlement was joined in 1622 and 1623 by short-lived settlements at nearby Wessagusset (present-day Weymouth), whose settlers either joined the Plymouth colony, returned to England, or settled in small outposts elsewhere on Massachusetts Bay. Plymouth's colonists faced great hardships and earned few profits for their investors, who sold their interests to the settlers in 1627. 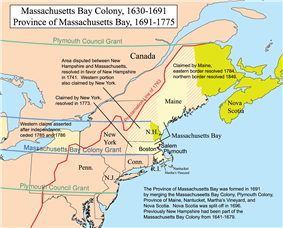 The Charters and General Laws of the Colony and Province of Massachusetts Bay. Boston: Commonwealth of Massachusetts. 1814. Adams, Charles Francis; Nash, Gilbert (1905). Wessagusset and Weymouth. Weymouth, MA: Weymouth Historical Society. Adams, Charles; Nash, Gilbert (1905). Wessagusset and Weymouth. Weymouth, MA: Weymouth Historical Society. Anderson, Robert Charles (1995). The Great Migration Begins: Immigrants to New England, 1620–1633. Boston, MA: New England Historic Genealogical Society. Bowen, Clarence Winthrop (1882). The Boundary Disputes of Connecticut. Boston: James R. Osgood. Bremer, Francis (2003). John Winthrop: America's Forgotten Founder. New York: Oxford University Press. Bremer, Francis; Webster, Tom (2006). Puritans and Puritanism in Europe and America: a Comprehensive Encyclopedia. ABC-CLIO. Field, Edward (ed) (1902). State of Rhode Island and Providence Plantations at the End of the Century: a History. Boston, MA: Mason Publishing. Fry, William Henry (1908). New Hampshire as a Royal Province. New York: Columbia University. Guiley, Rosemary (2008) . The Encyclopedia of Witches, Witchcraft, and Wicca. New York: Facts on File. Hayes, Kevin (2008). The Oxford Handbook of Early American Literature. Oxford: Oxford University Press. Heath, Dwight (ed) (1986) . Mourt's Relation: A Journal of the Pilgrims at Plymouth. Cambridge, MA: Applewood Books. Hubbard, Bill (2009). American Boundaries: the Nation, the States, the Rectangular Survey. Chicago: University of Chicago Press. Labaree, Benjamin (1979). Colonial Massachusetts: a History. Millwood, NY: KTO Press. Main, Gloria (2001). Peoples of a Spacious Land. Cambridge, MA: Harvard University Press. Mayo, Lawrence Shaw (1936). John Endecott. Cambridge, MA: Harvard University Press. Moore, Jacob Bailey (1851). Lives of the Governors of New Plymouth and Massachusetts Bay. Boston: C. D. Strong. Morison, Samuel Eliot (1956). The story of the "Old Colony" of New Plymouth, 1620–1692. New York: Knopf. Morison, Samuel Eliot (1981) . Builders of the Bay Colony. Boston: Northeastern University Press. Nagl, Dominik (2013). No Part of the Mother Country, but Distinct Dominions - Law, State Formation and Governance in England, Massachusetts and South Carolina, 1630-1769. Berlin: LIT. Rogers, Horatio (2009). Mary Dyer of Rhode Island: The Quaker Martyr That Was Hanged on Boston. BiblioBazaar. Stratton, Eugene (1986). Plymouth Colony: Its History & People, 1620–1691. Salt Lake City, UT: Ancestry Publications. Thomas, Hugh (1997). The Slave Trade: the Story of the Atlantic Slave Trade, 1440–1870. New York: Simon and Schuster. Vaughan, Alden T (1995). New England Frontier: Puritans and Indians, 1620–1675. Norman, OK: Oklahoma University Press. West, Willis (1922). The Story of American Democracy, Political and Industrial. Boston: Allyn and Bacon. Wheeler, Richard (2009) . History of the Town of Stonington, Connecticut. Baltimore, MD: Genealogical Publishing Company. Winthrop, John; Dunn, Richard; Savage, James; Yeandle, Laetitia (1996). The Journal of John Winthrop, 1630–1649. Cambridge, MA: Harvard University Press. ^ Hawke, David (2003). Everyday Life in Early America. New York: Harper. p. 66. ^ Foster, Thomas (October 1999). "Deficient Husbands: Manhood, Sexual Incapacity, and Male Marital Sexuality in Seventeenth-Century New England". The William and Mary Quarterly 56: 723–744. 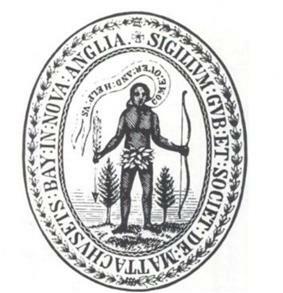 ^ The colony's first seal, depicting a Native American with arrows turned downwards, saying "Come over and help us", an allusion to Acts 16:9. The structure of the colonial government evolved over the lifetime of the charter. The freemen"), and a council of assistants similar to a board of directors, and ended with a governor and deputy governor, a bicameral legislature that included a representative lower house, and a body of freemen, a subset of the colony's adult inhabitants, who were authorized to vote in elections. 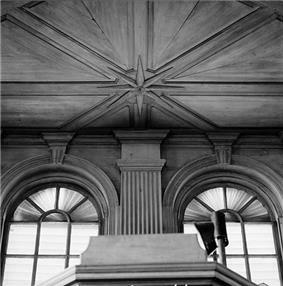 The council of assistants sat as the upper house of the legislature, and served as the judicial court of last appeal. Colonists arriving after the first wave found that the early towns did not have room for them. Seeking land of their own, groups of families would petition the government for land on which to establish a new town; the government would typically allow the group's leaders to select the land. These grants were typically about 40 square miles (10,000 ha), and were located sufficiently near other towns to facilitate defense and social support. The group leaders would also be responsible for acquiring native title to the lands they selected. By this means the colony expanded into the interior, spawning settlements in adjacent territories as well. From 1686, the colony's territory was administratively unified by New France and conducted by French and Indian raiding parties. John White continued to seek funding for a colony. On 19 March 1627/8, the Council for New England issued a land grant to a new group of investors that included a few holdovers from the Dorchester Company. The land grant was for territory between the John Endecott, one of the grantees. The next year, Naumkeag was renamed Salem and fortified by another 300 settlers, led by Rev. Francis Higginson, one of the first ministers of the settlement. The first winters were difficult, with colonists struggling against disease and starvation, resulting in a significant number of deaths. In 1623, the Puritan minister John White (1575–1648) of Dorchester, in the English county of Dorset. White has been called "the father of the Massachusetts Colony" because of his influence in establishing this settlement and despite the fact that he never emigrated. The Cape Ann settlement was not profitable, and the financial backers of the Dorchester Company terminated their support by the end of 1625. Their settlement at present-day Gloucester was abandoned, but a few settlers, including Roger Conant, remained in the area, establishing a settlement a little further south, near the village of the Naumkeag tribe.